The Open section will run the same as it did in 2018. Teams of five players, any age or gender. Women's Racketball / Squash57 did not take place in 2018 but we are looking to get this off the ground with teams of three. Gender is the only restriction players of any age can compete. 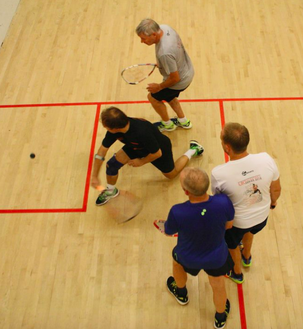 In the UK-Racketball Series the Over 50's attracts the largest number of participants. We have decided to run teams of five players with three singles strings and one doubles string. Players participating in the same fixture cannot take part in both the singles and doubles. This can however be changed around before the next fixture. In total teams will play four matches per fixture. If one team wins three or four of these matches they are victorious. If the score in matches is two all then the team that has won the most games will take the victory. If matches and games are both tied then the result will be determined by points count back.